Green Mountain Boxwood is a naturally deer-resistant evergreen shrub that makes for an excellent year-round hedge. The plant’s upright and naturally conical habit makes it popular both among topiary fans and those merely wanting a uniquely shaped border in their outdoor space. Miles of Green Mountain boxwoods growing at the nursery, ready to be used in landscape projects all over the US. These healthy roots keep the units intact when removed from their containers for planting. Each InstantHedge boxwood unit weighs under 40 lbs, making them easy for a single person to maneuver. All of our boxwoods are propagated in-house. These liners are almost ready to be planted into their troughs. Our boxwood units are full and lush, ready to form an instant knot garden or low border. 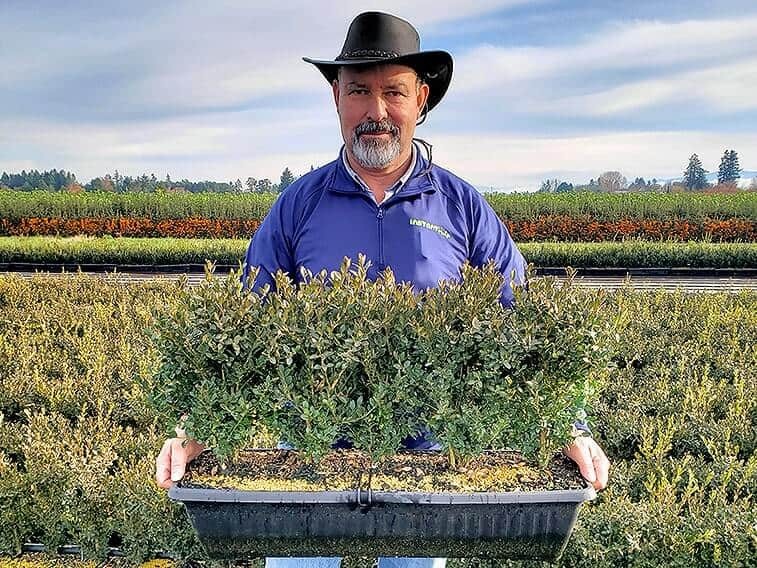 InstantHedge boxwoods are uniform, healthy, and easy to use. The boxwoods are carefully pruned to ensure uniformity and health. The boxwood units range from 18-24" tall, are 32" long, and 10" wide. InstantHedge boxwoods ship 24 per pallet rack for low shipping costs and protection during shipping. In recent years, the Boxwood as green mountain has become one of the most popular ornamental plants for landscape professionals, who frequently use box hedge for a healthy deer-proof hedge. As the Buxus Green Mountain Boxwood grows well in both full sun and partial shade, it’s an easy hedge to grow and maintain in a variety of exterior settings, provided it receives regular waterings in well-drained soil. Clusters of small greenish-cream flowers appear in the spring, giving the hedge a pleasant short-lived fragrance on top of its usual scent. For a shorter hedge, the Green Mountain Boxwood is a smart and stylish choice, as it’s been the preferred shrub for knot gardens, country gardens and borders for centuries. Without the nuisance of deer or rabbits, you can avoid the use of pesticides. Your boxwood hedge can stay naturally healthy and you don’t need to mess with unnecessary chemicals. As a relatively slow-growing hedge, at 3 to 6 inches per year, the Boxwood green mountain is easy to maintain at your desired height and is ideal between 12 to 36 total inches. The leaves of this hedge are famously resilient to the seasons and will stay a vibrant bright green throughout the year. The leaves of the Green Mountain as a boxwood hedge are famously resilient to the seasons and will stay a vibrant bright green throughout the year. This boxwood thrives in enriched and lightly acidic well-drained soil. A properly mulched root zone will help contain moisture and keep the shrub cool in hotter climates. Check out laurel hedge, another evergreen hedge variety. Green Mountain is more resistant to root rot than most other cultivars of Boxwood. That said, there is still some susceptibility to root rot, blight and leaf spots. Common pests include the boxwood leafminer, boxwood mite and boxwood psyllid. Nematodes can be an issue in the South. Seasonal displays of flowering herbs, shrubs, trees, and perennials are anchored and united with evergreen boxwood hedges. Soft evergreen hedges like this boxwood (Buxus) make a stone patio softer and more inviting even when planted in modern, geometric shapes. Various parts of the garden can be clearly defined with carefully-placed boxwood (Buxus) InstantHedges. A shared courtyard at this townhouse is bordered elegantly with boxwood (Buxus) as well as yew (Taxus) hedges. Since boxwood (Buxus) hedges can be maintained at a short size, they are an ideal choice for keeping a clean border along pathways like this. Layers of boxwood (Buxus) hedge combine to look like ripples in a pond in this artistic landscape application. Nicely-maintained boxwood (Buxus) hedges can help to define angles and boundaries in a contemporary design such as this. Why Choose a Green Mountain Boxwood Hedge? There are many different species and varieties of boxwoods available on the market, but we and millions of others prefer Green Mountain for some very specific reasons. Buxus x ‘Green Mountain’ (a hybrid) has been one of the most popular varieties in the US since its introduction in the 1970s. It surpassed many of the standby varieties due to its wonderful appearance, hardiness, and low maintenance needs. It can grow in full sun to nearly full shade, and deer won’t touch it. It is versatile and tough, and we just can’t get enough of it. One of the main reasons to love Boxwood as Green Mountain is for its lovely appearance. Boxwood has been the landscape plant of choice for thousands of years, and Green Mountain offers significant improvements over the older varieties. Boxwoods have been used in gardens for hedges as far back as 4000 BC when they were favored by the Egyptians (we know, it’s crazy). They were then used extensively throughout Europe before being introduced to the US in the 1650s. Boxwood hedges can be found at many historical estates throughout the world, and it is a key ingredient in historic estate restoration projects. 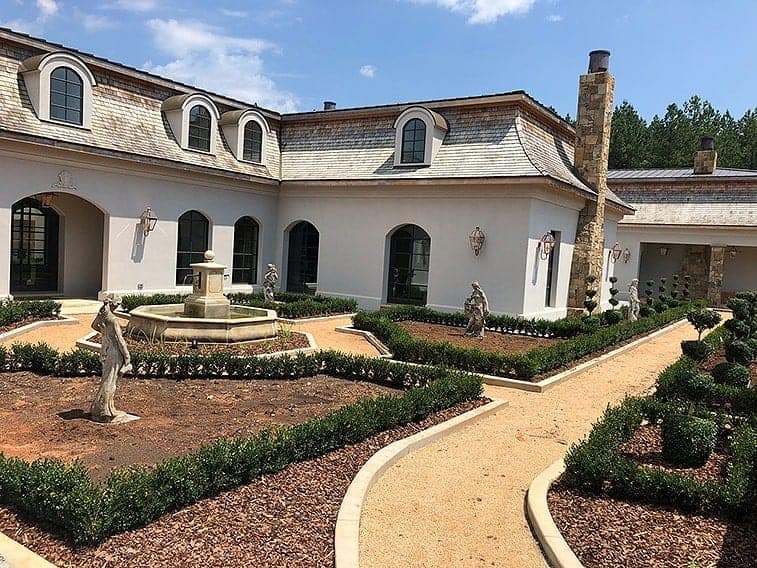 An estate in North Carolina used Green Mountain InstantHedge to create this classic French Provincial look. One of our fields of Green Mountain boxwoods showing off their lovely summer color. One of the most exciting things about Green Mountain is its excellent winter color. Many boxwood cultivars experience some degree of winter bronzing, and it can take on a very unattractive hue on many varieties. Green Mountain, however, has very little bronzing in winter and it really only happens when they are in full sun. As soon as the weather begins to warm in spring, the bronzed tips are quickly replaced with a lush green leaf color. Green Mountain has a moderate growth rate for a boxwood, increasing by about 4 inches per year. This rate can be increased by optimum water and fertilizer. Typically, growth slows after they reach about 15 years of age. This moderate growth rate means you can achieve a sizeable boxwood hedge without having to wait very long, but you also won’t be burdened with heavy maintenance requirements. At around 15 years old, left unpruned, it can reach around 3.5’ tall by 2.5’ wide. Not only is Green Mountain a beauty, but it is incredibly tough, hardy, and easy to grow. Deer and rabbits avoid boxwoods. Green Mountain does not have any other serious pest issues. Some things to watch for with any boxwood are psyllid, leaf miner, and mites, but all of these can be easily treated with simple cultural methods or low-intensity insecticides. Our boxwood units are a comfortable size to begin with but can be grown quite a bit larger if desired. Green Mountain boxwood can be grown in parts of every state. Green Mountain is one of the most cold-hardy boxwoods available. Bred in Canada originally, it grows well down to USDA Zone 4. Its growing region is truly huge. Box Hedge prefers a drier growing environment to a very wet one. Once established, it can be quite drought tolerant. It is best to water deeply with drip irrigation once per week or so in the driest times of year (summer in some areas, winter in others). Keeping water off the leaves is important for the health of any boxwood. The most common topic surrounding boxwoods over the past few years is Boxwood Blight. This fungal disease is easily spread from plant to plant, particularly in wet areas. Infection results in leaf drop and eventual death of the plant. It affects boxwoods, Sweet Box (Sarcococca sp. ), and Pachysandra. No boxwood variety as of yet has been shown to be fully resistant to Boxwood Blight, but there are definitely some that are more resistant than others. 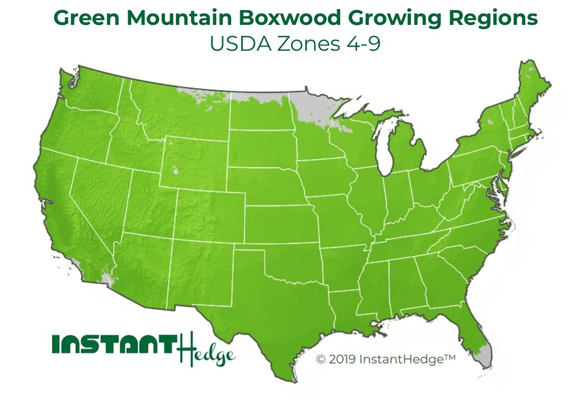 Green Mountain has shown itself to be among the top varieties for resistance, although different studies have had inconsistent results regarding exactly how near the top it falls. 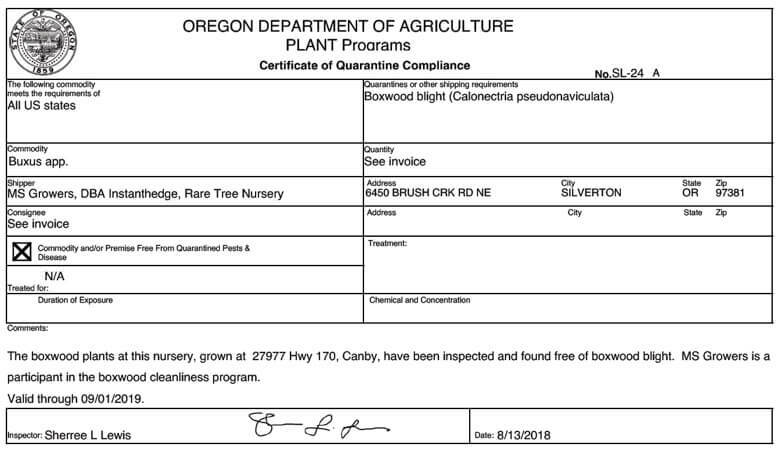 Our boxwoods are certified blight-free by our participation in the voluntary Oregon Boxwood Blight Cleanliness Program. We go through rigorous cleanliness practices and have regular inspections to ensure our boxwoods are 100% clean. We are approved to ship boxwood into any state. While the thought of Blight can be scary, the good news is that it can be effectively prevented and controlled by careful cultural practices. The main factors are cleanliness (cleaning up leaf debris, thinning plants to improve airflow), and water practices (avoid leaf wetness and planting sites must be well draining). There are also some products available that can be applied to control the pathogen. If you do have an area where you have lost boxwoods to blight, we don’t recommend planting boxwoods again, but maybe try a substitute such as Hick’s Yew (Taxus x media ‘Hicksii’). Boxwood hedges are incredibly easy to care for, which is especially wonderful since they are typically planted in large quantities. Instead of trying to wrangle a weed-like privet hedge, do yourself a favor by planting low-maintenance boxwoods. This boxwood InstantHedge was planted in winter, giving it time to acclimatize before the spring flush. The best time to plant a boxwood hedge is in fall or spring. In more temperate climates where the soil is workable throughout the winter, planting in winter is also a good choice. Summer planting is possible, but it is important to keep the hedge well-watered to avoid unnecessary stress that may weaken the plants. Whenever you choose to plant, choose a well-draining planting site, do not bury any of the trunk of the of the plants in soil, and make sure to water thoroughly right after planting. A generous application of mulch is very beneficial. Boxwoods are not “hungry” plants, and if the existing soil has a pH level of 6.5-7 you may not need to supplement at all. Applying some compost or a slow-release fertilizer on top of your mulch layer in late fall may be beneficial, but is likely not necessary. It is important to water your boxwood hedge well right after planting to help the plants get established. After that, they will need the 1-2” of water per week, whether from drip irrigation or rainfall. Overhead irrigation is not ideal for boxwoods as leaf wetness is a good way to spread common boxwood diseases. The soil should be allowed to dry between periods of watering, but do not let it get so dry that the plants begin to show signs of lack of water. One yearly pruning is plenty to control Green Mountain boxwoods. The best times to prune are late fall, winter, and early spring. You can use hand shears or an electric trimmer, but make sure the blades are sharp. To prevent spreading disease, sanitize the blades with alcohol when moving between groups. Boxwoods are extremely versatile, proven by the fact that they are used just as often, if not more, today as they were in ancient Egypt. The different Buxus species are native to regions all over the world, from Europe to Asia. They suit many different landscape styles and can be grown in a wide range of areas. Boxwood hedges are equally at home in the grand knot gardens of Versailles as they are on a modern rooftop garden at a hotel in New York City. 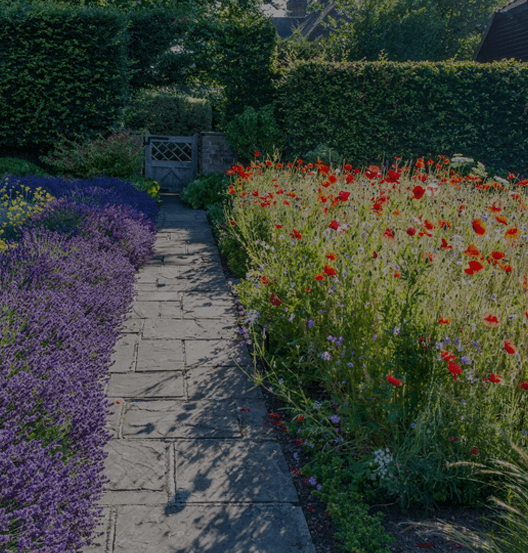 Humble cottage-style gardens can use them to reign in drifting flowerbeds, and they look smart lining paths and sidewalks in suburban areas. It’s hard to go wrong with a tidy, evergreen, low-maintenance hedge like boxwood. Boxwood hedges are equally at home in a grand estate garden and in a clean, modern setting. Green Mountain boxwood grows well in all different exposures, from full sun to nearly full shade. It isn’t bothered by deer, and it tolerates urban pollution well. It grows well in containers as well as in the ground. You’d be hard-pressed to find a spot where a boxwood wouldn’t grow. Boxwoods can be grown almost anywhere. Our boxwood hedges can be planted as straight or curved borders, as a radius or circle, or any other pattern you can imagine. The units can easily be trimmed to fit a certain space, and they can also be scored and curved. They are young enough when they are shipped that they can be pruned to any desired shape. InstantHedge units can be cut to fit any space or scored and curved to fit any design. 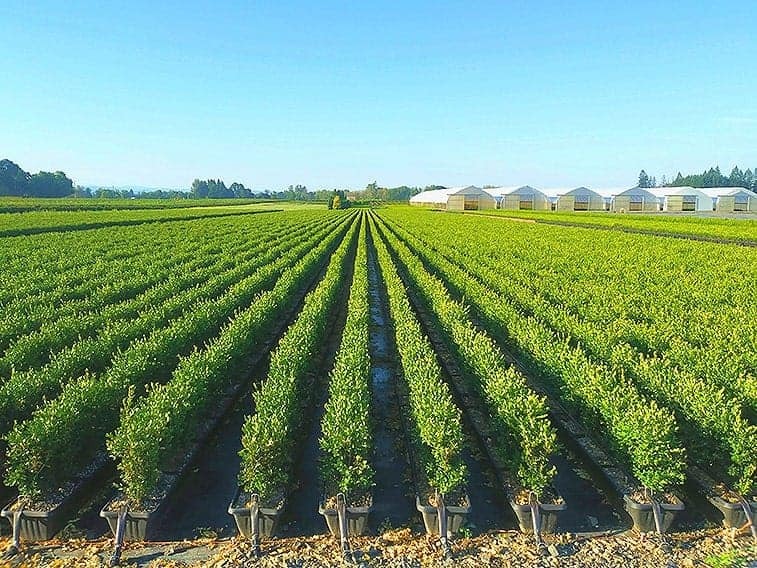 Green Mountain boxwood has one of the largest growing regions of any hedge type we grow. It can grow in almost the entire United States. That can’t be said for most plants! Why Choose a Boxwood InstantHedge? Planting a traditional boxwood hedge means digging dozens, if not hundreds or thousands, of little holes. You must try to keep them in a straight line. It also means purchasing dozens, if not hundreds or thousands, of tiny boxwood plants and planting them in all the little holes. Then, you wait for several years for all the little boxwoods to become bigger boxwoods. 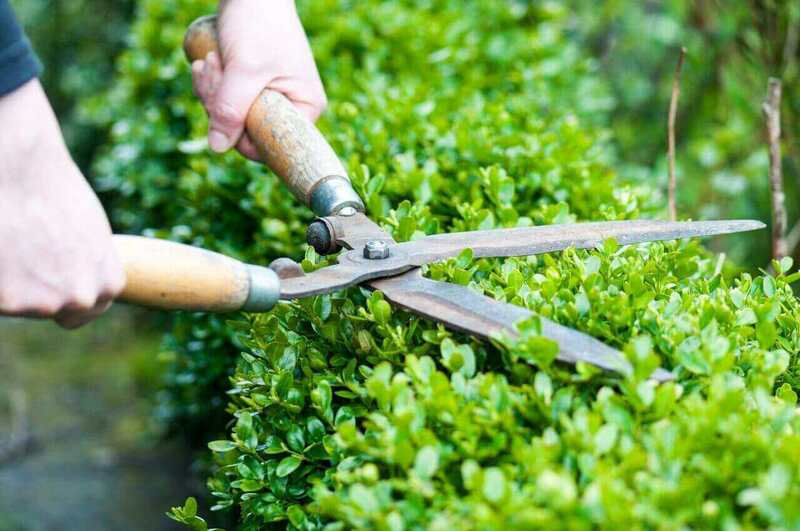 As they do, you must shape the hedges repeatedly and hope that you don’t make any mistakes that might not be fixable. A traditional boxwood hedge takes years of waiting for a finished hedge to mature. Planting a boxwood InstantHedge means digging one long trench, perhaps very quickly with a mini excavator. You buy the exact amount of hedge units needed for your linear footage, then set the 32” InstantHedge units in the trench, end to end. They are pre-shaped, pre-spaced, and pre-finished. You will have a finished hedge in one day. 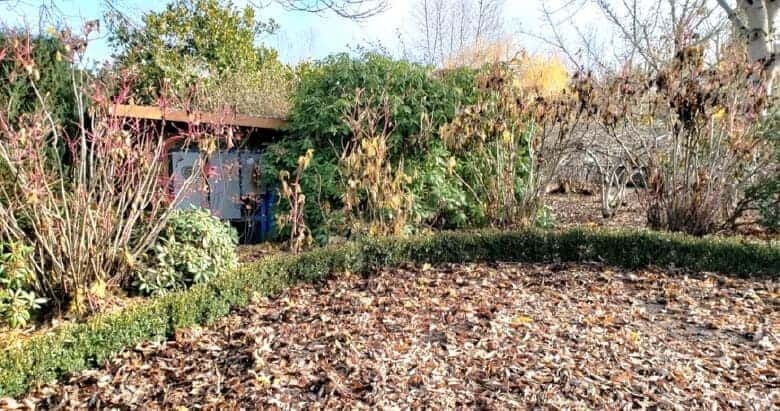 Planting an InstantHedge gives you a finished hedge in one day. When you plant a traditional boxwood hedge, you may be tempted to start with bare-root or very small plants to save on initial costs. You are very likely to lose plants due to the stress caused by bare-rooting or by simply planting them too small. When you start with an InstantHedge, the plants have vigorous, healthy roots and will experience little to no transplant shock. They arrive ready to thrive and grow, after being given the best possible start by the InstantHedge experts. A video is worth a million words. See for yourself the speed, ease, and versatility of Boxwood InstantHedges. Urban businesses gain instant curb-appeal with a tidy, uniform boxwood hedge encircling their building. Government building areas and universities often have wide open areas for landscaping. Boxwood knot gardens provide year-round structure and interest. Knot gardens almost always showcase boxwood (Buxus) which looks very nice when interplanted with perennials and other flowering plants. A formal outdoor meeting place such as this can be made more private with the use of privacy hedges like the yew (Taxus) in the background. Lower boxwood (Buxus) hedges bordering the patio provide an attractive border. Artistic symmetry can be implemented in a formal garden with the use of uniformly-grown boxwood (Buxus) InstantHedges. A low boxwood (Buxus) hedge for a formal knot garden looks great with a mixed purple and green European beech (Fagus sylvatica) hedge. This European-style courtyard appears much more organized and well-kept with the boxwood (Buxus) hedge border. Whimsical "mazes" are created using a low boxwood (Buxus) hedge and a few other types of boxwood interspersed. An elegant country garden with a water feature bordered by boxwood (Buxus) hedges and the greater part of the garden framed with taller yew (Taxus) hedges. Multiple layers of boxwood (Buxus) hedges can form a sea of lush green foliage among artistic accents in a formal garden. Venues like resorts, spas, and lodges can add a powerfully peaceful elegance to their grounds using boxwood hedges to create knot gardens. Public parks, botanical gardens, and historic estates can use low boxwood hedges for a simple yet extremely elegant design. Botanical gardens can use boxwood hedges to display other interesting plants to the best advantage. The clean lines of a boxwood hedge form the backbone behind the seasonal displays of perennials, annuals, and other flowering plants. This formal courtyard looks tidy with a perfectly uniform boxwood (Buxus) InstantHedge border. A peaceful space is created in a city park using boxwood and yew hedges to designate rooms in the landscape. Boxwood (Buxus) InstantHedges can be used to form contours like this by scoring the roots and fanning the hedge unit to form a curve. An impressive knot garden can be planted in a day using InstantHedge boxwood units. Low boxwood (Buxus) hedges provide a nice display at the intersection of wide paths in this public garden/estate. The garden at this historic estate balances the whimsical topiaries near the house with acres of perfectly manicured boxwood hedges. Intricate designs such as this can be achieved almost instantly with a boxwood (Buxus) InstantHedge! Historic estates (or new estates hoping to achieve an historic look) always look right with an expansive boxwood knot garden. This charming cottage garden uses boxwood hedges to lead visitors to peaceful resting and viewing spots. This whimsical cottage garden stays tidy-looking by using boxwood hedges to add structure. Pool areas gain privacy with tall hedges and definition with low boxwood hedges, which also soften the lines of the stone work. A boxwood (Buxus) hedge can be kept narrow to create a partition between various plant groups in a multi-layered cottage garden. 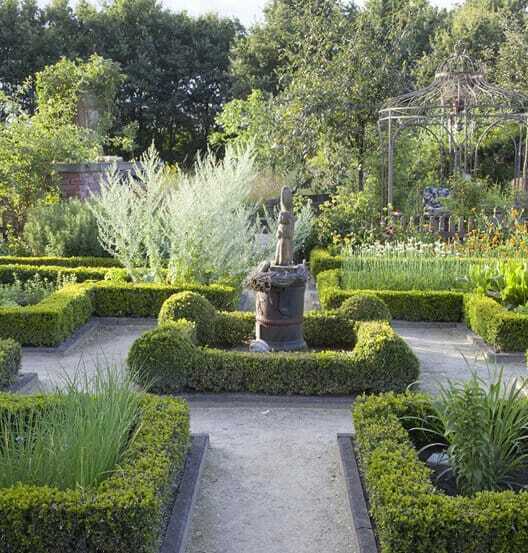 Footpaths are neatly bordered in a knot garden style with boxwood (Buxus) hedges in this country garden. Walkways are evenly bordered with boxwood (Buxus) hedges while the entire country garden is framed with European beech (Fagus sylvatica). A low boxwood (Buxus) hedge as well as a taller yew (Taxus) hedge can be used in conjunction with one another to create an outdoor courtyard. 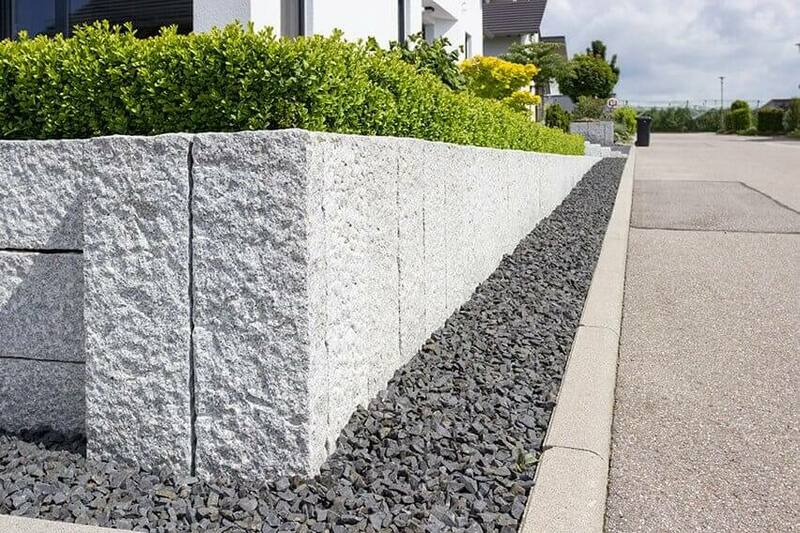 Large, sloping properties benefit from using hedges to add stabilize the soil as well as adding structure and beauty to the landscape. Historic homes and country settings can use low boxwood hedges to line paths and highlight courtyards and patios. Walkways around this pond are bordered symmetrically with boxwood (Buxus) hedges. The sharp angles of this pond are mimicked and softened by the surrounding boxwood hedge. Boxwood (Buxus) hedges are the ideal type of hedge for framing walkways and defining paths. Flowering plants are readily contained within beds by using a low boxwood (Buxus) hedge as a border in a country garden such as this. The eye is guided around this well-planned garden by following the lines of the boxwood hedges to focus on pieces of art and interesting plants. Boxwood (Buxus) hedges used along with brick creates a splendid contrast between texture and color that is quite complementary. Boxwood and beech hedges are used in this cottage garden to create an inviting entryway between the front and back yards. This comfortable patio for outdoor seating and dining is highlighted and softened with a low boxwood hedge. Artistic symmetry can be implemented in an elegant country garden with the use of uniformly-grown boxwood (Buxus) InstantHedges with a taller European beech (Fagus) hedge behind. Various plant shapes contrast nicely with the angular, well-kept boxwood (Buxus) hedges in this landscape. This secluded garden spot uses boxwoods to create fascinating pattern for visitors to ponder as they pause on the bench. A sophisticated knot garden like this can be achieved instantly with boxwood (Buxus) hedges as well as European beech (Fagus sylvatica). Both a boxwood (Buxus) hedge and a darker green yew (Taxus) hedge are at home in this well-designed modern landscape. Both boxwood (Buxus) and yew (Taxus) hedges can be used to create a type of park in this country garden. Boxwood (Buxus) hedges frame the walkway of this densely-planted cottage garden. Hostas, delphiniums, and other perennials are lovely in the summer, but planting boxwood around them ensures year-round interest. Create an impressive entry by lining walkways with boxwood hedges. A formal knot garden such as this makes for an elegant entryway to this building. In any type of landscape such as this villa, a boxwood (Buxus) hedge makes a nice complement to other plants like the roses pictured here. Modern garden meets cottage garden in this lush design featuring an abundance of flowers contained by geometric boxwood hedges. Ferns, flowers, trees, and stone paths are highlighted by the surrounding low boxwood borders. A clear border is achieved by this boxwood (Buxus) InstantHedge lining the walkway around this outdoor eating area. A boxwood (Buxus) hedge is attractive with a variety of plants such as the herbs and grasses shown here. Buxus boxwood low hedge border knot garden vegetable country. Buxus boxwood low hedge border knot garden country estate. Buxus boxwood low hedge border knot garden cottage country estate. Buxus boxwood low hedge border knot garden entry cottage estate. Buxus boxwood low hedge border seasonal color estate park garden.